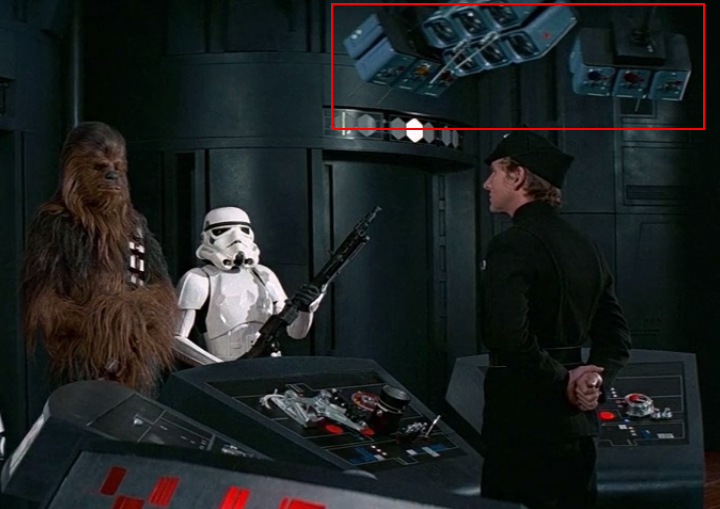 In the original Star Wars, when rescuing Leia, our heroes shoot the guards, then spend a few seconds shooting some equipment. What are these objects and why are they shooting them? This one looks like door controls, since you see them elsewhere. I guess they don't want reinforcements coming in. 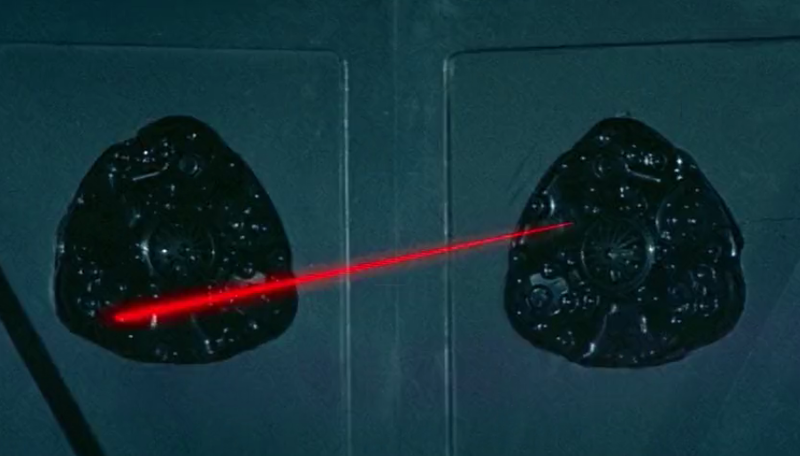 The first picture is a door control - we see these in other locations near doors, and I'm pretty sure we see Luke shoot another one out (which also controls a bridge) when he and Leia are on the run after being separated from Han and Chewbacca. The second item is an automated holocam which provides a "multi-dimensional" surveillance feed and also targeting data for the third device, which are automated laser projectors. We see variants of the holocam in several other media (although mostly sub-canon like the Jedi Knight games where you must destroy the holocams to prevent being seen on some missions), but we do see the laser projectors in action in the Clone Wars as automated laser traps. Your answers are available from the Star Wars Customizable Card Game, the greatest thing that happened to my brother and I in middle school. Note: this picture is the one that Luke shot in the hangar bay after Darth Vadar killed Obi-Wan, not the one Han shot in the detention block. So many door controls! Still, it is obviously the same prop. These three cards were in the initial card set (Premiere) from the game. I'm not sure the cannon-icity of these cards, since they came out in 1995; aka long ago in a galaxy far, far away. This was a time when Star Wars fandom consisted of the three real moves, 20 year old action figures, Timothy Zahn novels, and crazy fan sites on the nascent internet. But in any case, there are your answers! The startled guards are momentarily dumbfounded. Luke and Han have already pulled out their laser pistols and are blasting away at the terrifying Wookiee. 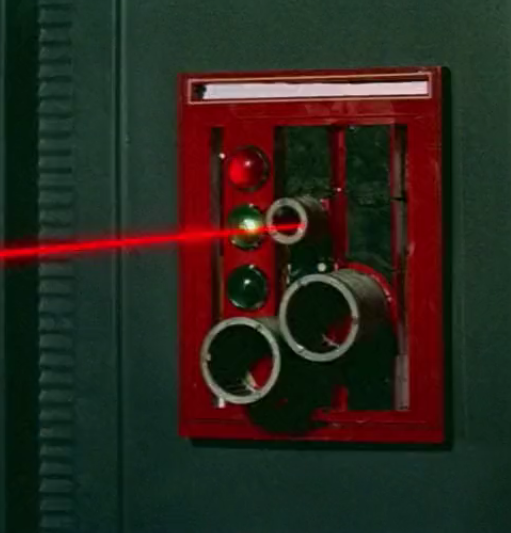 Their barrage of laserfire misses Chewbacca, but hits the camera eyes, laser gate controls, and the Imperial guards. The officer is the last of the guards to fall under the laserfire just as he is about to push the alarm system. Han rushes to the comlink system, which is screeching questions about what is going on. He quickly checks the computer readout. Han shouted, “Go get him!” and grabbed a blaster from a fallen guard. The lieutenant finally realized that Han and Luke weren’t real stormtroopers and reached for his own blaster. Han disabled him. Then he, Luke, and Chewbacca kept blasting until every security sensor was a shattered mess. Both he and Luke had darted clear of the rampaging Wookiee, pulled out their pistols, and were blasting away at him. Their reaction was excellent, their enthusiasm undeniable, and their aim execrable. Not a single shot came close to the dodging Wookiee. Instead, they blasted automatic cameras, energy-rate controls, and the three dumbfounded guards. Pointing his pistol at the [Comlink] panels, Solo blew the instrumentation to silent scraps. What are the transparent boards with glowing lines?